If you’re planning to have a few drinks before it’s back to work next week, maybe this will whet your whistle. 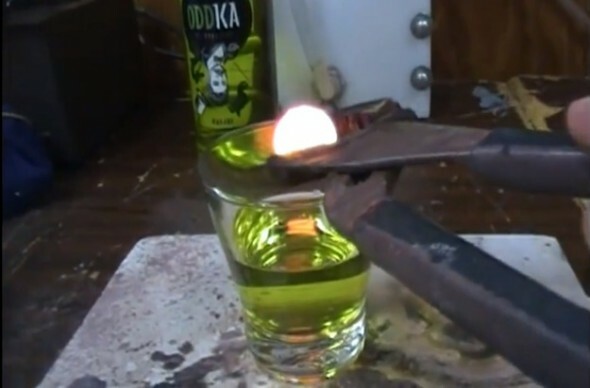 The red hot nickel ball (RHNB) is back again, and this time it’s taking on vodka. But not just any vodka — this is wasabi-infused vodka. It’s not like theRHNB can taste it, but the color is fun. You can probably guess dropping a hot ball of metal into a liquid is going to cause it to boil, but this is mid-proof liquor. Not only does it boil, it boils quickly and violently. The boiling point of water is 100 degrees Celsius (212 degrees Fahrenheit), whereas the boiling point of ethanol (the alcohol molecule we consume) is about 78 degrees Celsius (172.4 degrees Fahrenheit). The RHNB is, of course, much hotter than that, but the ethanol in the vodka is still boiling off faster than the water is.